In addition to familiarization flying provided directly by Regional Cadet Air Operations, some Squadrons provide additional familiarization flying in powered aircraft. Such flying is an optional / complimentary training activity funded by the Squadron Sponsoring Committee. 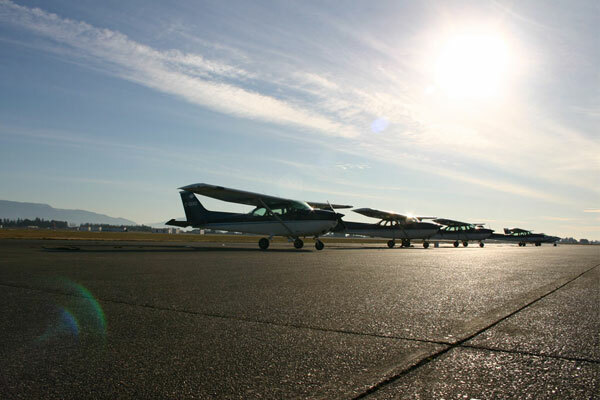 Optional familiarization flying is strongly encouraged by both the Air Cadet League and DND as a means to broaden and enhance the aviation experiences of cadets. However, it must be remembered that in the interests of safety, all familiarization flying activities are strictly controlled by DND. Squadrons often view the process of securing approval for power familiarization flying as complex or difficult, but nothing could be further from the truth. As with all cadet activities, this process starts when the Squadron staff enter the training request into the Corps / Squadron Activity Request (CSAR) system. Once a CSAR request has been submitted, the J3 team will review and approve the activity from the perspective of overall planning, organization, safety, and funding. The file then moves to the RCA Ops O for scrutiny of the flying aspects, including the currency and qualifications of the aircrew, the suitability of the aircraft, and the scope of flying to be conducted. The RCA Ops O will either approve the activity and issue an Air Tasking Order, send the file back to the squadron for change or further information, or cancel the request. The approval authority for all air cadet familiarization flying activities is the Regional Cadet Air Operations Officer. RCA Ops (Pacific) has developed a guide for squadrons to use in the planning and conduct of familiarization flying activities. Squadrons are strongly encouraged to review this guide when contemplating the conduct of familiarization flying in powered aircraft, as it contains all information vital to the approval process. With clear understanding, communication, and cooperation, it is very straight forward to plan familiarization flying for your squadron, and to have that plan approved. Remember that the review and approval process is there entirely to protect your cadets from harm and to ensure that they have a safe, fun, and rewarding experience. If you are unsure about the process or what is required, RCA Ops (Pac) staff stand ready to help guide you through the process. In some cases, we may be able to help you find a qualified pilot for your activity. Please ensure that you give us enough time to do our job properly, short notice (less than two weeks) requests will not be authorized.